This annotated figure shows the positions of various landmarks surrounding the Apollo 14 landing site on the moon's Fra Mauro highlands as seen by the LRO spacecraft. The small white arrows highlight locations where the astronauts' path can be clearly seen. A newsnapshot from NASA?s newest moon probe has revealed the 38-year-old tracks leftoverfrom a grueling moonwalk by two Apollo astronauts who tried, and failed,to reach a tantalizing crater. Thephotograph was taken by a camera on NASA?s Lunar Reconnaissance Orbiter (LRO) andshows the terrain surrounding the landing site of Apollo 14 astronauts AlanShepard and Edgar Mitchell, who touched down on the moon Feb. 5, 1971 in theirAntares lander. It was released Wednesday and confirmed that the astronauts camejust 100 feet (30 meters) from the rim of their target, Cone Crater, beforethey turned back, LRO researchers said. At firstglance, the image appears to depict a stark lunar surface devoid of anyevidence that humans were there. But a closer inspection can reveal the glints of theAntares lander and a nearby experiment deployed by the astronauts, which appearat the lower left of the snapshot. The tracks from the boot prints of Shepard andMitchell appear as wispy, winding lines that are a slightly darker shade ofgray from the surrounding terrain. The regionof the moon explored by Shepard and Mitchell on the Apollo 14 mission is arocky, hilly area known as the Fra Mauro highlands. The mission was the thirdof six Apollomoon landings between 1969 and 1972. 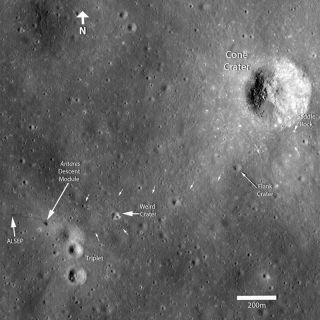 LRO hasbeamed home an earlier view of the Apollo 14 landing site, as well as snapshots of TranquilityBase, the first manned landing site visited by Apollo 11 astronauts on July20, 1969. Researchers overseeing the probe?s main camera, called LROC, fromArizona State University released the new images. On Feb. 6,1971, during the second moonwalk of their 33-hour stay on the lunar surface, Shepardand Mitchell tried to reach the distant Cone Crater in order to peer down atits bottom. The crater was nearly a mile (1.4 km) away from Antares - placingthe lander out of sight for the moonwalkers - and the journey was exhaustingsince it was almost entirely uphill. To makematters worse, Shepard and Mitchell had trouble walking uphill in the softlunar surface and their map of the terrain left much to be desired. ?Anotherproblem was that the ruggedness and unevenness of the terrain made it very hardto navigate by landmarks, which is the way a man on foot gets around,? wrote Shepard,who died in 1998, in an account of the mission for NASA?s History Office a few years after the mission. ?Ed and I had difficulty in agreeing on the way to Cone, just how far wehad traveled, and where we were.? It wassometimes easier, Shepard wrote, to carry an equipment cart that was supposedto ease their burden during moonwalks because dragging it as designed was justtoo tough. ?Andthen came what had to be one of the most frustrating experiences on thetraverse. We thought we were nearing the rim of Cone, only to find we were atanother and much smaller crater still some distance from Cone,? he wrote in theNASA account. ?At that point, I radioed Houston that our positions weredoubtful, and that there was probably quite a way to go yet to reach Cone.? In the newLRO image, one landmark dubbed Saddle Rock that was photographed by Shepard andMitchell can be easily spotted, showing how close the astronauts actually wereto their lunar quarry. Shepard,one of NASA?s original seven Mercury astronauts, and Mitchell ended theirsecond moonwalk on a light note despite their frustration trying to reach ConeCrater. Shepard attached a six-iron golf club to the end of a collecting toolto become the first person to golf on the moon. WhileShepard and Mitchell worked on the lunar surface, their crewmate Stuart Roosaorbited the moon in their command module. They left the moon on Feb. 6, 1971and returned to Earth three days later. The $504million LRO spacecraft, meanwhile, is part of NASA?s first wave of new missionsto explore the moon. The orbiter launched June 18 on a year-long mission to mapthe moon, study its surface composition and search for hidden water ice tuckedaway in the permanent shadows of craters at the lunar poles.